No matter what industry or which country you look at, maintenance performance is pretty poor on average. That’s obviously not a good thing. But what makes it worse is that the principles of modern maintenance management have been well defined and documented for a good 30+ years. So why, after all this time, do so few organisations achieve excellent maintenance performance? To be honest, it’s not all doom and gloom. There are certainly star performers out there. A handful of companies that deliver a world-class maintenance performance. What is it that they do that the rest of the industry can’t seem to pull off? Is maintenance management so hard that only few companies can master it? We all know that plant maintenance is not rocket science. It really isn’t that complicated. It really isn’t that hard. So it’s not unrealistic to expect a lot more companies to do a lot better when it comes to their maintenance management. First of all, we’ve made it all much more complicated than it needs to be. Ever looked at the maintenance excellence model provided by a typical consultancy? Models with 15 or 20+ elements are not uncommon. Do you do CBM or PDM? When was the last time you did an FMECA or FMEA? So many of these acronyms overlap. So many are not clearly defined. Some are just plain confusing. And most are not well understood by many of the Maintenance & Reliability (M&R) professionals around the world. The consequence of all this unnecessary complexity? We do not focus enough on what really matters. We do not focus enough on the basics of maintenance management. Too often, we end up chasing fancy sounding acronyms. One after the other we go for the latest trend in industry. In the process we ignore the simple basics. And that’s to our own detriment. 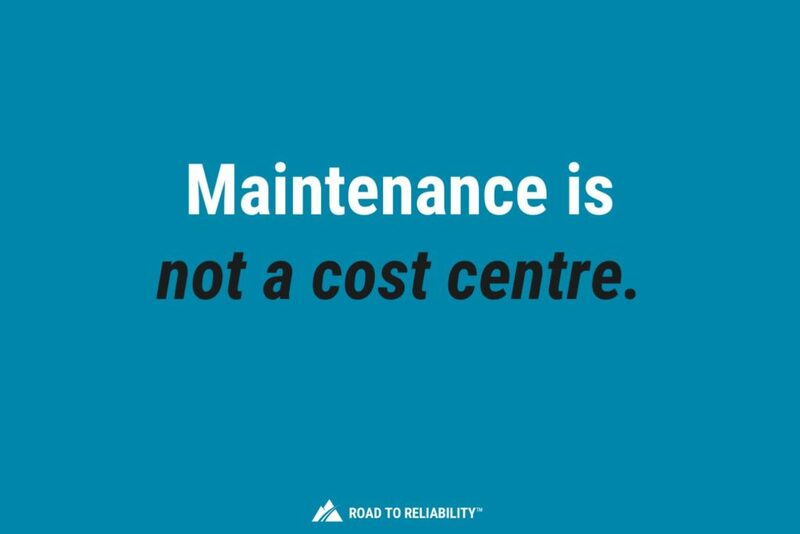 Because it’s exactly those basics that enable maintenance excellence and high reliability. This is not just my view. Research done in the late 1990’s by Winston Ledet and others showed that the best performers focus on the basics.1Ledet, W. (1994) The Manufacturing Game. Available at: http://www.manufacturinggame.com/resources/themanufacturinggame.pdf. And they do these basics exceptionally well. This fits with what I’ve seen in my own experience. Whether that was in Europe, Asia, the Middle East or Australia. Every time it was the same. The best performing plants applied laser-like focus to the basics. And did these basics exceptionally well. Adopt an overly complicated approach and you will lose sight of those basics. I believe that as an industry we need to provide more simple solutions and frameworks to all those thousands of plants around the world that are struggling to achieve reliable operations. Simplicity helps to create focus and a belief that you can do it. That’s exactly why I created the Road to Reliability™ framework. Second problem? A large knowledge gap in the global maintenance and reliability community. There are many well-spoken, extensively published experts out there. No doubt about it, we have a very capable community with real centers of expertise. We have real thought leaders. And it’s an active community. But we also have a wide disparity in capability. There are thousands of maintenance and reliability practitioners around the world. And many have gaps in their knowledge and understanding of basic maintenance principles. 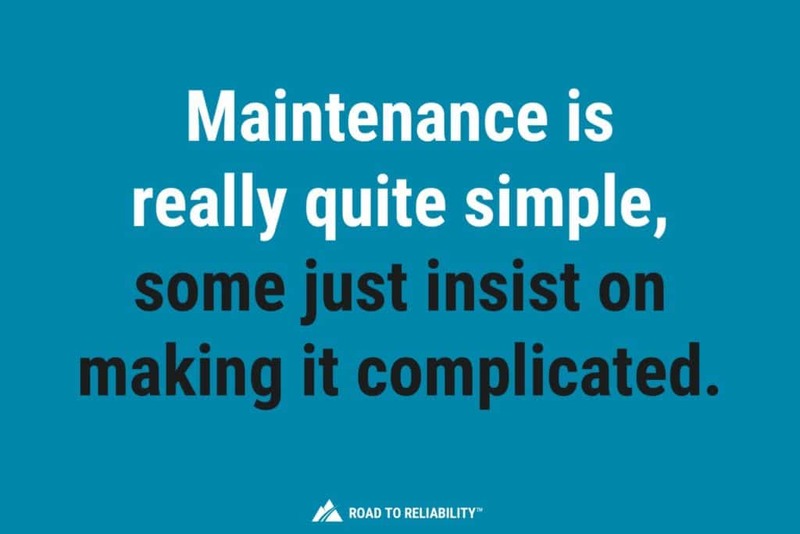 When talking to people across the globe I find that many maintenance and reliability practitioners still don’t really understand the concepts that Reliability Centered Maintenance (RCM) teaches us. Knowlan and Heap completed their research that lead to the birth of RCM in the late 1970’s – so that’s some 40 years ago. John Moubray’s published his RCM II book some 20 years ago, in 1997! 2Moubray, J. (1997) Reliability-Centered Maintenance Second Edition. Industrial Press. Available at: https://www.amazon.com/Reliability-Centered-Maintenance-Second-John-Moubray/dp/0831131462. Despite all that time, all our industry standards, countless industry books and free online resources, many organisations across the world still fail to apply these principles. As an example, RCM teaches us that most failure modes are not the result of wear out or have age-related failure modes. In fact, most failure modes show a random failure pattern. That means the likelihood of the failure occuring tomorrow is just as high as the likelihood of it failing next month. Or in 3 months’ time. How many maintenance managers or plant engineers do you know that understand this? And I don’t just mean theoretically. But in practical terms that translate to what PM tasks we do and why. Conducting a time-based replacement to deal with a random failure mode is a waste of time. Yet it remains common practice in many organisations. So how do we address this gap in knowledge and understanding? The only way to resolve this gap is education. We need to educate more on the fundamentals that drive maintenance & reliability performance. We need to improve what we teach but also how. The effectiveness of conventional classroom training is too low. Most of the knowledge presented in classroom training is not retained by the trainees. In fact, most of it’s lost within a few weeks of the training. And rarely does that training lead to people making real improvements once back in their organisations. And so the return-on-investment for this type of training is close to zero. The other problem with the classic, classroom-based approach to training is that too may people are left behind. There are just too many maintenance and reliability practitioners around the world that don’t have access to high-quality training. help students to make a lasting, positive change in their organisation. That motivates, creates value and adds to the bottom line. And it closes the knowledge gap. Most companies don’t pay enough attention to reliability during the design phase. Projects focus on minimizing capital expenditure. And usually do little more than paying lip service to Lifecycle Costing. Even in projects that do use Lifecycle Costing the impacts of design and equipment choices are not properly converted into higher operating costs, or reduced equipment reliability and availability. The result is projects start up with sub-par designs. Built out of sub-par equipment. Often built and commissioned in a hurry which introduces plenty of defects. The result? Soon after start-up the plant maintenance teams find themselves overwhelmed by equipment failures. And the typical reactive maintenance cycle starts. This is the time when companies start to pay attention to reliability. Because now, the lack of reliability is hurting their bottom line. The problem is, by now it is exponentially harder – and exponentially more expensive! – to resolve those reliability issues. You can only reach the inherent reliability of your equipment. That is, your plant can only be as reliable as it’s been designed to be. So if you struggle with poor design, poor equipment selection or poor installation you cannot maintain your way out of that. You will need to design those problems out of your plant. You will need an effective defect elimination process. Can we get companies in asset-intensive industries take the same proactive approach to reliability as is common practice in the airline industry? I’m sure we can, but it will take a lot of effort, time and some serious leadership. I can hear you argue: we don’t reward poor performance… Actually, most plants around the world do. Not formally through the company key performance indicators. Instead, poor performance is rewarded through our culture and behaviours. Our cultures reward a reactive maintenance strategy. We don’t see many companies rewarding excellent preventive or predictive maintenance that prevented failures. A lack of failures usually does not hit the company ‘headlines’ so to speak. Nor does it translate into rewards. Spectacular failures on the other hand do. Those who respond heroically to high-profile failures often get a pat on the back for a job well done when everything is back online. Some of my own best staff appraisals have been in years where I worked in a highly reactive maintenance environment. In a plant that was literally falling apart around us my team and I got the best feedback in the situations when the whole plant was down and we busted our guts to get it back online before incurring million dollar penalties. In one case we even chartered a private jet to fly some overseas specialists into the country. Praise all around for a world class fire fighting performance. The best thing we did was to slowly remove defects. To improve our PMs. And to implement a robust planning and scheduling process. We turned a reactive maintenance environment into one where we were on top of the work – not the other way round. After 2 to 3 years the place was barely recognisable. Not just physically, but also in terms of productivity. We never received anywhere near as much praise for that as we did for our ‘heroics’ when the plant was down. Don’t get me wrong, I’m not complaining. What I trying to show is that our cultures tend to reward the wrong things. We reward the so-called ‘overtime heroes’. Instead, we should seek out those in our organisations that have prevented failures by the systematic application of good maintenance practices. We should go out and find people who do good proactive maintenance work. Recognize their contribution and reward them. Look for things like a well-written new PM task. A CBM task that picked-up an impending failure. Or someone who removed a defect. And recognise them. Next time you have a major failure do not reward people for the fire-fighting or the overtime. Instead, be critical about why this was allowed to happen. Make sure your team does a Root Cause Analysis. And reward the completion of the RCA actions as a step to becoming less reactive. One of the most quoted problems when you speak to Maintenance & Reliability professionals is “the culture” or the “lack of support” in their organisations. I recognise these statements and these are definitely topics we need to address. But, we have to realize that culture and lack of support are often, in more ways than one, the consequence of another, underlying problem. And that is a lack of leadership. When you point a finger remember that three fingers point back at yourself. As a maintenance & reliability community we have to face the fact that when we find cultures that resist our desired change, or we do not get the support we need, we should look in the mirror and ask ourselves why we can’t get our message across. Before we delve deeper into Leadership let’s explore the lack of support and culture issues a bit more in depth. The issue of lack of support comes down to how top management views planta maintenance. And typically, this is not too positive. Maintenance is seen as a necessary evil. In many plants, maintenance is only talked about, only gets attention, when things go wrong. When production stops, or worse, someone gets hurt. This sets a negative culture. It doesn’t promote better performance or improvement. How many times have you as the maintenance manager felt marginalized? Felt that production is always the most important. That the maintenance department and its staff play second fiddle? Having to argue with Production to take equipment offline to conduct preventive maintenance? Chances are this sounds familiar. Too many management teams forget that maintenance is key to higher reliability. That maintenance is a contributor to increased production and profitability. And that plant maintenance is an essential element to a safer working environment. But it is. 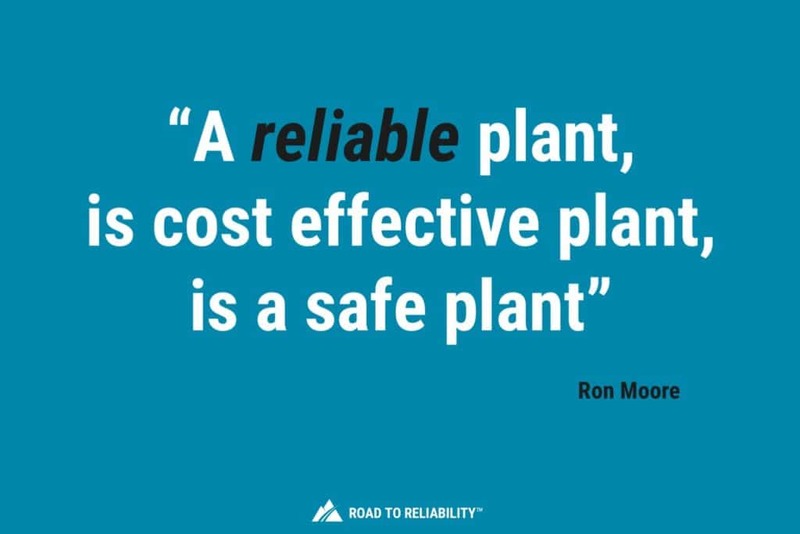 As Ron Moore once wrote: “A reliable plant is a safe plant is a cost effective plant”. If you simply cut maintenance costs you will shoot yourself in the foot. Things likely quality or production will suffer. Usually, this doesn’t happen immediately. There is a time lag. That’s why many managers have gotten away with ruthlessly cutting maintenance. Increased their plant’s profitability in the short term and got their next promotion. We all know at least one or two managers who’ve done that. And gotten away with it. But history is also full of examples what happens next: poor reliability. Production and quality losses. And in some cases accidents with dire safety or environmental consequences. Lives lost. Leaders of world-class plants treat maintenance different. They understand the relationship between maintenance, reliability, production, profitability and safety. It’s exactly that approach, that level of understanding that we need to instil at all our plants. How do we do this? Education is the only answer. As leaders, we need to educate our management proactively. We need to be able to sell the value maintenance and reliability bring to our organisations. In short, as a leader, you need to be able to sell. A common complaint from those trying to improve maintenance one way or another is around the resistance in the organisation. But is cultural resistance really the problem? Any culture, no matter how good, or bad, is resistant to change. Think of a culture as a collective way of behaving, feeling, thinking and believing. Once established those practices tend to protect themselves and resist change. So, instead of seeing resistance to change as a problem, accept it as a fact of life. A fact of life that we need to learn to deal with. Like we’ve learnt to deal with gravity or traffic jams. You have to realize and accept that improving maintenance is more about people than engineering or technology. As technical people, we like to deal with facts. With processes, systems and technology. More so than engaging and motivating people. And that’s where it goes wrong. If you want to improve your maintenance performance realize that those improvements will have to be delivered by people. Whether it’s your front line or engineering support, it always comes down to people. You will need to engage with them. You need to show them that there is a better way of doing things. You’ll need to motivate them to change. Explain what’s in it for them. And before you get to that stage you need to convince your plant leadership to get on-board. Fail to do that and you won’t get the resources you need. So whilst culture is critical to our success it is not the resistance to change that is our problem. The real problem is that most maintenance managers don’t understand the value and importance of their organisation’s culture. Too many maintenance managers fail to successfully engage and mobilize their organisation. Often it is simply because they do not know how to. Or because they’re uncomfortable operating in that space. But they can’t be an effective leader like that. and how to deliver improvement sustainably. Generic, academic education won’t suffice. It needs to be practical and action packed or it will fail to gain traction in our community. As we mentioned earlier, the most common problems raised by Maintenance & Reliability practitioners around the world is “the culture” and “the lack of support”. I see these problems as symptoms of a deeper problem. A lack of real leadership focus on maintenance & reliability in most organisations around the world. It’s not hard to understand why we would have a Maintenance Leadership problem. You see, most maintenance managers come up through the ranks. They develop strong technical skills, but are often not well versed in leadership or business skills. Too many maintenance managers can’t sell the value of maintenance to their management. And so maintenance remains a necessary evil. Something that just costs money and not as a critical enabler to production and profit. We also find that too maintenance managers don’t know what “good looks like”. What is a good maintenance performance? What makes it excellent or world class? How much your organisation could improve? What level of uptime you should be able to achieve? How much you can reduce your costs by? Or how much more product you can produce? Without answers to those questions, you’ll never sell your improvements to senior management. Unfortunately, the gap in leadership skills in our community is also evident from the poor track record of improvement projects. So many improvement projects fail to deliver the promised results. That undermines credibility. And it often stops the drive for continuous improvement dead in its tracks. Organisations who fail to deliver on an improvement project often end up falling back into their old, reactive ways. Some do this consciously. In others, it happens by stealth. The results are dire in both cases. So how do we address this leadership gap? Again, education is the answer. We need education that teaches basic business and finance skills to our maintenance & reliability managers. Education that builds practical leadership skills that can be applied. Education that provides a solid understanding of what maintenance & reliability excellence looks like. And how to achieve it. Now, the importance of plant leadership being involved in reliability has been long talked about, but Terrence O’Hanlon from www.reliabilityweb.com has really brought this to the forefront in recent years with his fantastic work around Reliability Leadership® 1 and the Certified Reliability Leader (CRL) program. If you haven’t already had the chance to join the CRL program, you should certainly consider doing so. Equally important is the lack of high-quality maintenance & reliability management education. Only a small number of organisations deliver high-quality maintenance & reliability management training programs. Unfortunately, these programs are only available in a handful of locations. So of the thousands of maintenance managers working around the globe only a few have access to this level of training. So, how can we move our community forward if so many of them have no access to structured, high-quality training and coaching? This is exactly why the Road to Reliability™ was founded. To provide world-class training to Maintenance & Reliability professionals around the world. Training based on a simple yet highly effective framework for reliability improvement. And in the coming months we hope to launch the first course. In this article, I outlined why maintenance management around the world isn’t what it needs to be. And that’s an understatement. For each of the problems, I touched on potential solutions. Most of the solutions require the application of leadership, but there is one more common thread to all the solutions. First of all, YOU must take action, educate yourself and educate others. Secondly, YOU must determine what good looks like for your plant and prepare a vision to take your plant there. Thirdly, YOU must enlighten your management so they value maintenance for the contribution it makes to the bottom line. Lastly, YOU must act as a catalyst for this change. This won’t be easy. In fact it will be a struggle. Many plants don’t have terribly enlightened plant management. And change is never easy – even with full management support. At last someone who speaks my language. I have lost count how many sites I have gone to who can not handle the basics or even see the benefit of completing the basics well. Every point made above I have come across. Only this morning I find a site willing to shut an asset down for 2 hours a month to check for loose bolts, instead of looking to lock washers or Loctite. When will people learn the best maintenance is no maintenance at all. Thanks Richard. So what was the outcome when you challenged the practice of shutting down to inspect bolts for tightness? Education is the key word which is common to all 8 problems, equally addressed to management, members of maintenance and production teams. Btw, I like the statement that “I am the solution”. Hi Cournel, I agree leadership is key to a lot of this. Are you familiar with the book “Good to great” by Jim Collins? In that, he talks about ‘Level 5 Leaders’ who focus on the success of the business and the people who work form and try to stay out of the limelight themselves. A very enlightening book that’s based on extensive research into 20 of the most successful companies (that went from good to great). I’m hoping to cover in a future post. Wow! I have not seen a reference to that book in well over a decade! It had so much good stuff in it. Rampant growth by acquisition has put companies far from the principle of the “hedgehog” and best manufacturing practices in my little world of work experience and networking – 1) assimilating the disparate organizations never fully gets done, and focus on the original business and sustaining (or getting your own house in order to begin with, for that matter) is neglected. The result is strategic chaos and no standard to look to within the company. And plant maintenance / reliability / asset lifecycle management is one of the biggest losers in this equation. I have been employed in maintenance positions for over 35 years now. What I see happening in the U.S. is that an understanding of basic maintenance principles declining with the younger generations of managers coming into leadership positions. I have observed the reactive activities you mention in your articles. I hear upper management calling for a more proactive approach to maintenance (until it costs $’s). It seems that American industries have done poorly with basic maintenance for so long, that today’s managers do not know what quality maintenance looks like. Thanks Kevin, I share your concern about a declining understanding in basic maintenance & reliability principles. And I’m not sure that modern technology like Big Data or AI can compensate for that loss in understanding? Erik, great article and great reply to Kevin’s comment. I have seen far too much of what Kevin and you have described and am saddened by the circumstance. The most distressing is your statement about Big Data and AI in you reply, I also fear it will be an untapped pool of information that they will be unable to understand or act on. You cannot buy Reliability, the same as, you cannot buy fitness. It takes hard work and effort at the individual level. As you state, education and focusing on the basics are things we all can do. Also there is amazing community support out there in the form of organizations, groups, websites and resources like “The Road to Reliability” that is available. Come on folks, join the movement. Your City, State/Province, Country need you! What stands out the most to me is companies still not investing in people. The complaints are all over how no one with experience is available for hire. Well train the ones you have. When you have education and experience your maintenance team is capable of implementing their own PM program. That is of course if they are allowed by upper management. .
You hit on all the keys that I try to convey to our leadership group. We have went thru so many different culture changes. Toyota based CI with a consultant which made a difference at 1st I would have to admit that but we never sustained any of it and have fallen back worse than we where before, then TPM implemented al wrong I only know because I have read a lot of books and everyone always jumps to implementation without establishing the foundation. 33 yrs in maintenance and I get journeymen come in and can’t properly thread a hole or lay out a work piece to a drawing with all the measurements given. A big issue I see is the lack of the simple basics that all the old tech’s when I started taught me. just one example and I will stop my rant. Take a large screwdriver and walk you equipment and listen for excessive noise through the frame, I don’t need all the fancy vibration analysis equipment I can check easily just like that if we get more profitable maybe we can purchase some of the nice things. I look forward to your education materials. Thanks for your comment James. With 33 years experience you must have seen it all! The issue you raise about failed implementations of frameworks like the Toyota Production System or Total Productive Maintenance are common. And often its down to not putting in place the fundamentals required to slowly and sustainably change the culture. I am glad I took my time to read this article. One of the best I have read in a couple of days.I will definitely play my part to ensure things change and I do hope that very soon I have the resources to make effective change soonest.. thanks once more for this enlightening article.You were just on point. Well done Eric! You have hit the nail on the head in describing exactly what I have seen and experienced first hand in my 40 years in maintenance. It really does all boil down to doing the basics really well. But above all, as we both know, the lack of Leadership is at the forefront of the issue. In many cases that lack of Leadership does exist in Maintenance. But when this problem exists, it is usually rooted at a much higher level than Maintenance. The education in what good and reliable Maintenance looks like needs to start at a much higher level than Maintenance. It no longer surprises me to be approached by a corporate manager that is looking for bottom line results, usually reduced costs in maintenance, after only 6 months into a project to turn an organization around that has been running as a highly reactive maintenance organization. In this case, the corporate manager(s) just don’t understand and that has a direct impact on what a maintenance organization will or will not be given, i.e. resources and time, to turn a sub-standard maintenance program around. Improving Maintenance is exactly as you said, It is more about people than engineering or technology. And we tend to overlook how important it is that some of the people we need to be considering in saying this are sitting in the corporate offices. Thanks Terry, great to hear that the article resonates with what you’ve seen and experienced the last 40 years! I have enjoyed reading your perspectives on this issue. It is exciting to read exactly what I have felt to be true thru anothers point of view. Not being alone and just knowing there are articles to draw this crucial information for me is priceless. Looking forward to reading more insights. Thanks again I really loved this article. Your material couldn’t have come at a better time for me even though I have heard about RCM for years. I have worked in the maintenance field as a technician, manager, CMMS Implementation specialist etc. for 30+ yrs. and started the path in the late 80″s early 90’s with a ” I am tired of hearing it’s broke and I fixed it!”. Like many of the comments expressed by others, reading your words, you have confirmed feelings felt many many years which is refreshing and needed. I have quite a few questions to ask and draft theories to discuss and looking forward to a course coming in the future.. Thank you for sharing your information for which I look forward to applying..
Hi Jim, great to hear from you and it’s humbling to hear how what I wrote resonates with someone who has been in the field 30+ years! Thank you. Hi Erik, very informative articles and so very true have had over 15years in the maintenance field and have seen alot of what you described first hand. Look forward to seeing more on this important issue. Thanks Art, I’m working on more articles that will fall under the Leadership & Culture element. Knowing that what I write is appreciated certainly is motivating so thank you for the feedback. Inmovation is.the key in.maintenance and Reliability and it has to ve driven by leaders..inmovation not necessarily be a mega project but a simple reliability improvement in a small equipment. This can surely change the way we think and make Maintenance a profitable affair. the maintenance systems in place today still contain antique strains and their limited evolution is a contribution from the various education systems not adapting or been changed to adapt to the ever changing world. The world is producing ever modernised machines , efficiency improvements , higher output requirements and not least the aim to use less and less manpower with limited training and skill input costs to optimize the bottom line. looking at new mining equipment received in the last three years versus machines from the early 2000’s a lot has changed, but the support systems (human, technical and operational) have actual not kept pace , result application the old way learning the painful way to change. Managed change can only be successful if educated leaders are willingly taking the “bull by the horns” without fear of failure to build a learning and compliance orientated culture. Where do we start this having 30 years maintenance experience and hwo can we ensure the foundations of education are changed? Thanks Erik for summarizing A to Z of plant maintenance. I have worked in the middle east with one of the largest oil &gas and my experience resonates with what you have explained. Good to hear that you are taking a step to run a training program which many industries are badly in need. Erik – thanks, again, for an insightful assessment of the compound nature of maintenance, or, more commonly, lack there of. The very word gives the impression to most that “status quo” has value over improvement. I find no argument and only truth in your “breakdown”, (no pun intended) and value your considerable expertise and passion to affect a positive shift in our approach and understanding to do the same within our respective margins. With regard to the call for focus toward education, my own experience has been that the senior and/or corporate management, more often than not, provides “mandatory” training, via HR, (Sorry, Human Resources, another one of those bewildering acronyms.) that may (or may not) have business value for required “process improvement”, but definitely demands your precious time and attention, regardless of your position in the company. Because these sessions are intended for all departments and/or their respective managers, they seldom contain any information applicable to Facilities and/or Maintenance. (One exception to this might be Project Management Training, whenever this is offered.) Worse yet, at some point or another in the training, it becomes apparent that the HR managers assigned with presenting this do not fully understand the concepts, themselves, that they’ve been tasked to explain to a level of clarification to acquire that all-important signature of acknowledgement and receipt. Training content and outcome intent aside, one value I’ve taken from this is that it may provide the only opportunity one may have to hear from other departments not typically accessed by the nature of your own work. The realization that you are not “the only one” experiencing seemingly insurmountable challenges can be both reassuring and unsettling in terms of how you may continue to view the company and your role within it. So, as you have surmised, the need to justify, fund and provide value-based training within the confines of the Facilities and/or Maintenance budget, is critical to moving from a consistently reactive environment to a proactive and reliability-centered workplace culture. Mahaloha. Dear Erik ,, its Great Article to follow and implement best Maintenance practices ,last 5 yrs i am also trying to implement best practices in our 14mt steel plant but not yet succeeded. thanks for valuable article which gives me insight to implement and follow best practices. share if you have best practices of Steel plant to make our plant to a World class ..
Great effort to explain the modern maintenance management, when plant management use this techniques & approach and apply it, they solve all major problems in maintenance. I am glad to share knowledge with you, and gained benefit was required. Thanks, Erik, for the insightful article! You have hit all the high points (or should I say low points) of why effective maintenance continues to struggle. We have so many tools, software, proven history, etc., from the few that have made it work. But the majority of organizations continue to make the same mistakes. Too few executives fail to see the benefits of investing in an effective maintenance program. Investment is the proper term since there is payback, however, not always immediate. I have seen too many employers give up before benefits are realized. The short-sightedness of these leaders have sabotaged quality initiatives and stripped American companies of the proper training. Apprenticeships are an extreme rarity in the USA. Some fault also falls on the Maintenance and Reliability community itself, though, because we have not fully developed the ability to speak the language that the CxOs understand – money. We know the programs are effective and result in greater profits for our employers, but we too often fail to present our case in those terms. Thanks for once again provoking thought! Thank you for sharing this great article for Maintenance. I have read several articles already regarding the maintenance and reliability, only on this article that I have learned that there are a lot to be done and needs to acted. “Basics is the key” thanks to the internet and to the people like you, we can learn a lot. Thank you for excellent articles!!!! You are totally right, people make maintenance difficult, and that is mostly due to the waste that consumes your time and space. I am busy with a proposal to increase production, after reading your articles the light has came up. Looking forward to your next article. Again many thanks..
Erik, what I have seen over time as a Tradesman plant worker, then long term educator of Wood Working machinery is this. Automation has progressed to the point the sales person says “the machine looks after it self” the machine has self diagnostics and automated lubrication “a complete novice can work the machine, with one days training” REALLY! $500,000 machine and you give a one day trained person control. You must be rich beyond comprehension. The other point is the worker cohort of today is not interested in long term study, they the student can get information from their smart device when ever and where ever they are. So how to integrate the up and coming workforce into todays machinery maintenance needs? First find the fixes, those who resist the throw away mentality. That may not be easy due to most of the new generation never being required to maintain what they use. Unlike the older generation that had to maintain their Push bike, Motor bike, Car etc, older generation learnt to maintain by necessity. Then give them their technology I.E. Short tutorial videos incorporating augmented reality to capture their attention, then deliver the vital information to address the issue. Therefore the videos need to be inhouse, they need to incorporate the real work and support the learner to first understand the issue then point to a solution. Lastly I believe Mentoring is the key to successful learning (transition of knowledge and skill gained by the Mentor to the learner) Rob. Hi Robert, thank you for your comments and thoughts. I really like the idea of the short videos, but especially your point on mentoring! All your writeup are all- time relevant and they come handing to me. Thank you for your passion and for sharing practicable knoledge. Thank you Paul, what more do you need to know about the random failure distribution pattern? This failure distribution pattern indicates that the likelihood of failure does not increase or decrease over the operating life of the respective equipment or component. That means that the likelihood of failure is the same today as it would be in the future. Modern electrical components typically have random failure patterns. If you really want to delve into this topic consider reading John Moubray’s RCM II book or a book like Practical Reliability Engineering by Patrick O’Connor. Actually I am working in O&M for more than 12 years, and a totally with your say maintenance isn’t a rocket science, I always say the maintenance isn’t an invention we just apply a procedures and some expectations. My concept in leading peoples and handling daily challenges in maintenance is to be the maintenance man and quality man in the same time that is the key in improving maintenance in our organization at recent time from my point of view, that because we are suffering from leak of Spares and reworking.